KoopaTV: Apollo Justice: Ace Attorney 3DS AND Ace Attorney Anime Release Dates! Of more interest to me right now is that CAPCOM didn't even bother to give English voice-acting to their own trailer. Compare to when CAPCOM released a similar trailer when they announced the release date for Phoenix Wright: Ace Attorney — Spirit of Justice. 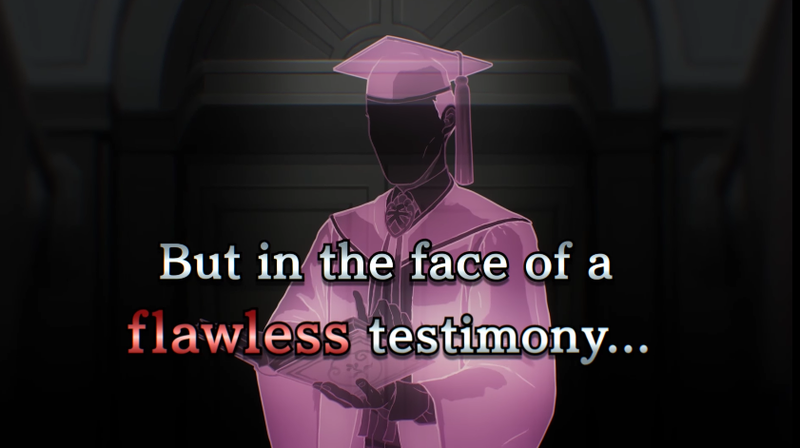 Yes, it's not fully voice-acted like the launch trailer was (so there is still hope for Apollo's debut game to get a proper trailer a month from now), but it was in English, and the two characters that got title cards (Phoenix Wright and Rayfa) at least spoke out loud. In this Apollo Justice: Ace Attorney trailer, Phoenix Wright, Kristoph Gavin, and Ema Skye got title cards but were mutes the entire time. What's with the trailer making Wesley Stickler out to be a big deal? Speaking of very questionable voice-acting, the Ace Attorney anime that we first broke to you over two years ago is finally coming to America. We told you a year ago that Funimation would be dubbing it, and then have not heard anything since. NOW it appears that the first 13 episodes will be released as a Blu-ray/DVD combo this January 23, 2018. You can pre-order it for $48.74, or buy it at retail for $64.98. Those prices strike me as absurd, because you can purchase Phoenix Wright: Ace Attorney Trilogy for $30 on the Nintendo 3DS (look for a sale at the end of this year) and play the game that is covered in the first season of the anime... and with two other very good games thrown in as well. Maybe my local library will have the episodes eventually, like they did with Phoenix Wright: Ace Attorney Official Casebook: Vol. 1: The Phoenix Wright Files. That'd be nice! Now if only the Ace Attorney movie got dubbed as well, like they promised. Anyone have any contact information for KoopaTV to pursue so we can inquire about that? This is KoopaTV's 1200th published article! He is honoured to dedicate it to Ace Attorney, which is a series that deserves a lot of KoopaTV's attention. It deserves your attention, too, which is why KoopaTV has been asking for people to submit Ace Attorney-related guest posts for the past two months. If you want a very generous point multiplier to your score in the KoopaTV Loyalty Rewards Program, then submit your guest post to submissions(at)koopatv(dot)org prior to the end of October 30, 2017. Of course, you are welcome to submit guest posts anytime you want, and you'll still be rewarded greatly if it's a good article. The last sale for Phoenix Wright: Ace Attorney Trilogy was the CAPCOM Summer Sale 2017, where it was $14.99. If you want to know who the voice cast is for the Funimation English dub, that was just announced. November 21 has happened, and you can view the new launch trailer for Apollo Justice: Ace Attorney and see if it meets Ludwig's standards. I've heard that the Ace Attorney anime was not the best adaptation of the games according to those who have watched it. Most say that the show suffered due to the cases being condensed to only a few short episodes which caused many details to be left out or altered as a result. That is quite a shame considering the characters and stories are captivating. I can only hope that the Professor Layton anime next year will be more faithful to the games or be comprised of completely original content instead. The animated movie "Professor Layton and the Eternal Diva", which is available on YouTube, was great, so I can only hope that the show will do the series justice. I can't speak to it personally as someone who only watched the first episode and then kind of thought it wasn't good. Rawk watched it more than I did, and made a bunch of videos putting different music to its opening. Movie/TV/anime adaptations always will drop things from games, since games are designed to be longer experiences (with filler) while other mediums are designed to be frequently interrupted with commercials and stuff for people with lower attention spans and not being able to have undivided timeless attention. I suppose that means books/manga are the best medium for game adaptations because it's just you and the book for as long as you want (like games), and you don't need to worry about some other book coming in 30 minutes. Unless you're reading it from a book store and the clerks are gonna kick you out. Indeed the price on the anime is absurd. It already nerfs Maya's presence so much to little more than a glorified plot device character, at the very least. As somebody who *REALLY* likes what she does in 1-4, that's beyond awful. I watched a sub of the film too, and I'm honestly not sure how I feel about it. On the one hand, nice Phoenix. On the other hand, Maya doesn't feel vibrant. So there was a sub of the movie on YouTube for years, but I didn't want to watch it by myself and wanted to watch it with other people (Rawk), but told him he's not allowed to watch it until he actually plays through the Trilogy first. ...So he finally did play those... in May. By now, the sub of the movie has disappeared off YouTube!